"You cannot grow and ripen grapes outdoor in this country". Vines were successfully grown in the southern part of Britain by the Romans. There are nearly 400 commercial vineyards in England and Wales. Nearly all are in the southern half of England and Wales but there are vineyards as far north as Lancashire and Yorkshire. Growing and training vines is straightforward - they are as easy to grow as Raspberries. Successful Grape Growing for Eating and Wine-making: A Practical Gardeners' Guide to Varieties, Husbandry, Harvesting and Processing . The Backyard Vintner: The Wine Enthusiast's Guide to Growing Grapes and Making Wine at Home . Growing Vines to Make Wines : A detailed guide to growing vines in English conditions and making wines from the grapes produced. It covers growing; vine varieties; site, soil and spacing; pests and maladies; propagation; vintage; fermentation; stabilization; bottling; and storing. From Vines to Wines : A comprehensive guide to growing your own grapes and making homemade wine. You must select a vine that will be resistant to disease. One disease in particular is phylloxera - a small creature that feeds on vine roots. Phylloxera originally came from America around the year 1860. Within 15 years it was responsible for the destruction of between 66% and 90% of European grape vines. The American vines had become tolerant to it. You can buy European vines (vinifera vines) that have been grafted onto American rootstocks. These roots are tolerant of (not killed by) Phylloxera. Buy hybrids - genetic crosses between European (vinifera vines) and American vines that inherit the best qualities of both. It is very important when selecting your vine to choose an early cropping variety. These types of vine have the best chance of ripening in the English climate. 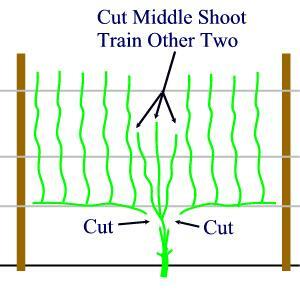 There are various ways to train your vines but I will describe how to grow your vines in rows or against a wall. 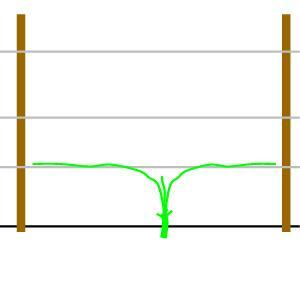 Leave a gap of at least 1 metre between rows and at least 1.2 metres between plants. You can plant your vine any time that it is dormant, generally between October and March. March is probably best as long periods of frost are avoided. If your plant is likely to experience long frosty periods then cover the lower buds with a pile of well rotted compost - draw it back when growth commences. When you get your vine, prune it down to the lowest 2 buds on each branch - this is essential if you are going to produce worthwhile crops. The purpose of pruning for the first 3 years is to build up a strong deep root system, if you don't achieve this then your plant will never be strong. Therefore the growth above ground must be limited so the majority of the plant's energy is directed to the roots. You should only allow your vine to fruit in the fourth year. Choose a sheltered south facing sunny position if possible. Avoid sites in partial shade - a south or south west facing slope is ideal. Growing vines against a south facing wall can bring success in locations too cold for growing completely in the open. Sandy, gravelly, well drained soil that warms up quickly is best. Drainage is vitally important - the roots must never become waterlogged. Two to three months before planting, fork in well rotted manure at the rate of one bucket per square metre. If your soil is light, the type that may dry out in summer, dig your hole to a depth of at least 200mm. If on the other hand your soil is heavy and retains a lot of water then dig to about 50mm or consider creating a mound above the soil level to aid drainage. Mark out where you want to position your vines using a piece of string to keep your rows straight and even. 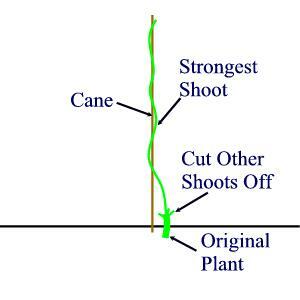 Before planting, push a robust cane into the ground so that 1.8 metres is above soil level. Dig a hole big enough to take all the roots. Holding the vine in by the stem space out the roots and cover with light soil mixed with silver sand and well rotted compost. Make sure the hole is well filled then tread well in. Continue along the row planting at 1.2 metre intervals. Allow only the strongest shoot to grow. Tie this to the cane and cut the other shoots off leaving only one or two leaves. After the leaves have fallen (November but no later than the end of December), cut the one strong shoot down to 3 or buds. Allow the 3 strongest shoots to grow - cut the others off. Install 1.5 metre high support posts every 2.5 to 3 metres. Attach support wires at heights of 0.5 metres, 0.75 metres and 1.25 metres. 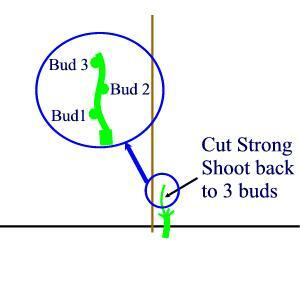 Tie two of the shoots horizontally to the lower support wire and cut the third back to 3 buds. (These 3 buds will produce the 3 shoots for nest years growth). Train the fruiting laterals from the two horizontal shoots upwards. 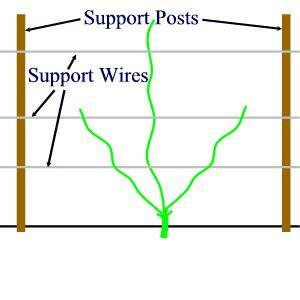 Tie them to the support wires. Allow 3 centre shoots to develop - as in Year 2 summer above- remove all other shoots. In August cut the laterals to 2 to 3 leaves above the top wire. 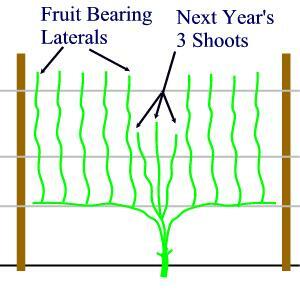 Cut off the two horizontal shoots with their laterals that have fruited. Train two of the 3 centre shoots horizontally. Cut the middle one back to 3 buds as described in Year 2 November. The cycle continues like this year after year.